These are certainly not the most exquisite-looking pineapple tarts around, but it is this imperfection in form that, in fact, speaks in their favor. First of all, they're obviously homemade (not by me)--not sleek, mass-produced medallions. Second, if the pastry hadn't cracked and crumbled in the prissy, delicate way that it did, then these wouldn't be real pineapple tarts, in my opinion--they did go through a long flight from Singapore to Tokyo in my backpack. I'm not going to share my own recipe or anything like that (although I've provided a link to one, below). I just feel like these things are so good, they should be getting more exposure. I'm positively mystified that after all these years, an appalling percentage of the Earth's population still has not heard the word, been touched by the golden light, tasted of The Pineapple Tart. Let's break these babies down. 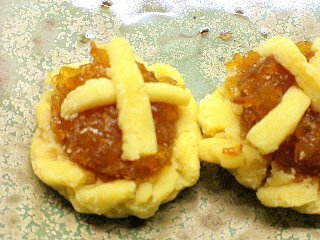 Pineapple tarts come in two forms, open-faced circlets (as in the picture above) or enclosed parcels. They're always little bite-sized things; you'll never see one great big honkin', nine-inch pineapple tart. Perhaps because of their shape, size, and snackable quality, some might want to label them cookies; however, "tart" rings truer in my mind, perhaps because the pale, buttery base or casing is somewhat like a savory shortcrust pastry. (Quick interjection: Throughout this post, "in my opinion" will be implicit in my pronouncements of what characterizes a "real" pineapple tart; dissenters are expected.) As you might be able to see from the photos, the pineapple tart's pastry is very fine and tender... and, strangely, dry--it is not in the least greasy, nor crunchy or cake-like. 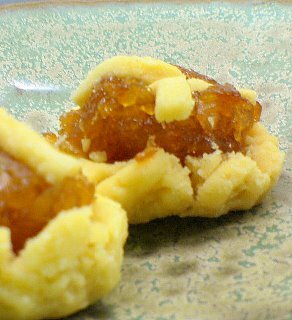 These qualities are the perfect match for the moist, sweet-tart filling, which is made from fresh pineapple that has been chopped and cooked down with sugar until it is a caramelized, amber color and firm enough to roll into little balls. When you bite into a pineapple tart, the pastry instantly begins to disintegrate in a rich, buttery crumble that perfectly balances the sweetness of the dense, almost chewy pineapple filling. For this reason, one should be wary of pineapple tarts with gigantuan balls of filling all but swallowing up the pastry, because these will be much too sweet. It's all about finding the perfect balance. Although this might raise a flurry of protests, I feel compelled to share the following tip: For the ultimate pineapple tart experience, nuke a couple of tarts in the microwave and then top the hot tarts with a scoop of vanilla ice cream. I cannot overemphasize how good this tastes, with the aromas of butter and caramelized pineapple heightened, and the contrasting textures and temperatures... Orgh. Now for a quick history lesson. Ahem. Pineapple tarts seem to be claimed by the Peranakans, the descendents of Chinese immigrants that settled in the Malay Archipelago hundreds of years ago. However, although I couldn't find anything online to confirm the fact, it's possible the recipe may have Portuguese influences as well, due to colonists who settled in Malaysia. I searched around and found a truckload of pineapple tart recipes, but many of them either sounded wrong or the pictures included with the recipe looked, well, bad (in this example, the filling looks pale and insipid and the pastry is so brown and glossy I can practically smell the cooked egg wash). The most promising recipe I could find came from the blog Pinkcocoa Tabetai, using what she calls the "creaming method." I do wonder if the addition of sugar is truly necessary for the pastry though. Also, you should definitely heed her advice and skip the canned pineapple, which is too sweet, juicy, and mushy to achieve the right consistency for the filling. Since I haven't tried the recipe myself though, I'm not sure how it would compare to my idea of the perfect pineapple tart. But her tarts in the pictures look very nice. Its a unsual time of the year for pineapple tarts? But then again, its never a bad time for a pineapple tart! Hi Shaz! You're absolutely right that pineapple tarts are a Chinese New Year favorite (I...er, forgot to mention that in my supposedly informative post). But I guess it's too good to be eaten only once a year, so really they're available all year long. Are pineapple tarts on sale, even when it's not CNY? I haven't seen any around... hmm.. I love this chinese new year crispy bikie snack called the "honeycomb". Have you had that before? It looks like a holey crispy snack in the shape of a flower. Oh when will Chinese New Year come again!!! Yeah, you can get pineapple tarts all year long. If you go East Coast Road in Katong, near to the Peranakan restaurant True Blue, you'll find stores and stores selling pineapple tarts and tons of other good stuff. I'm afraid I don't think I've ever had a honeycomb cookie. It's been a really long time since I actually was in Singapore to celebrate CNY and my family has never really gone all-out with the proper foods. I have special liking for pineapple. Anything that comes with pineapple makes it's way to my kitchen and so will this pineapple tart. Thanks for the recipe.